Phillies trade rumors - Valentin, Leiter, Lively - who stays and who goes? MLB Trade Rumors is a site which describes themselves as "a clearinghouse for relevant, legitimate baseball rumors." Each week at Phils Baseball, we grab their latest Phillies rumors and put them all together in one weekly post. The Phillies announced that infielder Jesmuel Valentin has cleared waivers after being designated for assignment and been sent outright to Triple-A Lehigh Valley. The 24-year-old switch-hitter managed just a .177/.258/.304 slash through 89 plate appearances in the Majors this season and turned in a fairly underwhelming .240/.346/.341 slash in Triple-A prior to being removed from the 40-man roster. Valentin’s bat has wilted as he’s climbed the minor league ranks and faced more advanced competition, and he’s not considered a strong enough defender up the middle to be a glove-first utility option. The Royals have claimed right-hander Ben Lively off waivers from the Phillies, according to an announcement from both teams. To make room on the 40-man roster, the Royals have designated left-hander Eric Stout for assignment. Lively, 26, will give the Royals yet another arm to evaluate as they stockpile potential rotation pieces for the 2019 season and beyond. The right-hander, originally acquired by the Phils in the 2014 trade that sent Marlon Byrd to the Reds, has a minor league option remaining beyond the current season, so the Royals will be able to shuttle him back and forth between Omaha and the Majors next year — in the event that Lively survives the offseason on Kansas City’s 40-man roster. It’s been a tough season for Lively, who has missed time with a shoulder injury. He’s been hit hard to the tune of a 6.85 ERA in a tiny sample of 23 2/3 Major League innings this season, though his Triple-A work — 2.42 ERA, 8.1 K/9, 2.6 BB/9, 0.52 HR/9, 42.3 percent ground-ball rate in 52 innings — has been decidedly more encouraging. Lively ranked in the bottom half of the Phillies’ top 30 prospects in 2016-17, per Baseball America, drawing praise as a potential fifth starter at the big league level with average to fringe-average stuff across the board. Lively has a 2.97 ERA in 266 2/3 career innings of Triple-A work, making him a more or less MLB-ready asset on which the Royals are taking a chance. He also turned in a 4.26 ERA with less-encouraging peripheral marks through 88 2/3 innings with the Phils last season. The move to the American League probably won’t help Lively much, though he’s going from a homer-friendly home setting, Citizens Bank Park, to a fairly cavernous one in Kauffman Stadium. Stout, 25, was beat up for seven runs (six earned) in just 2 1/3 innings with the Royals earlier this season. Though he posted solid bottom-line numbers at Triple-A in 2017, his pedestrian K/BB numbers, low ground-ball rate and good fortune on homers allowed contributed to an FIP (4.24) and xFIP (5.26) that were markedly higher than last season’s 2.99 ERA. Through 55 Triple-A frames in 2018, he has indeed regressed, working to a 4.75 ERA with 7.2 K/9, 2.1 BB/9, 0.82 HR/9 and a 37.8 percent grounder rate. Lefties have posted a .725 OPS against Stout between the Majors and Minors this season, though to his credit, he held same-handed opponents to a putrid .193/.264/.301 slash with a 22.5 percent strikeout rate against a 7.5 percent walk rate in Omaha a year ago. 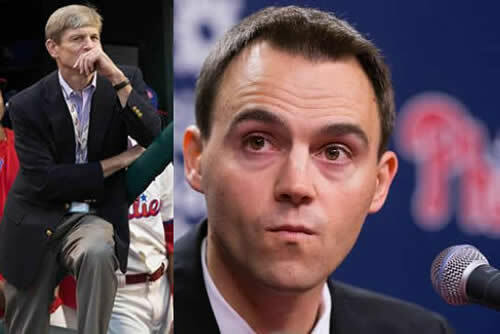 Some further changes are on the horizon in the Phillies’ front office, as farm director Joe Jordan has stepped away from the organization, Matt Gelb of The Athletic writes(subscription link). 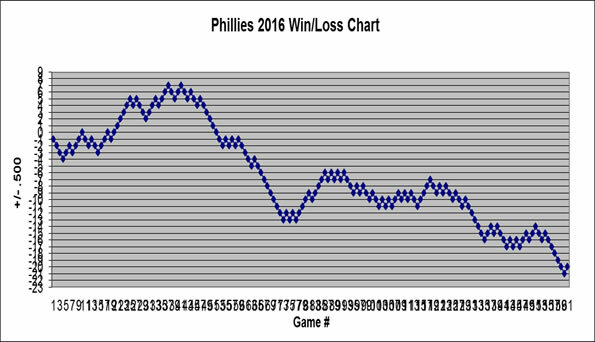 The Phillies have since confirmed Jordan’s departure. Gelb characterizes a “rift” between Jordan and the new front office, headed by GM Matt Klentak and president Andy MacPhail. The 56-year-old Jordan told Jim Salisbury of NBC Sports Philadelphia that he “had the greatest job” but “walked into [Klentak’s] office and told him I didn’t think I was the guy to take this thing forward.” Jordan had held that position since being hired by Ruben Amaro back in 2011 but knew both Klentak and MacPhail from prior experience working with the pair in the Orioles’ front office. Gelb’s column details Jordan’s departure at length, noting that increased usage of data, analytics and Trackman technology at the minor league levels have all been implemented under the new regime — among numerous other changes. Phillies skipper Gabe Kapler tells Scott Labuer of the Philadelphia Inquirer that the organization isn’t planning on assigning one set position to super-utilityman Scott Kingery at any point in the near future. Kingery has played shortstop primarily over the past couple of months but is also seen as an option at second, third and in the outfield. “The most sensitive, direct, and understanding way I can answer this question is that we don’t know,” Kapler says in response to questions of Kingery’s placement on the diamond in the long-term. Lauber also speaks at length with Cardinals third base coach and former big league utilityman Jose Oquendo about the manner in which Kingery has been used, as Oquendo himself was once one of the game’s most prominent utility pieces. Oquendo offers some veteran insight as a former player who thrived in that role for years, stressing that as long as the player buys in, he can enjoy success in that role. As Lauber notes, Kingery’s versatility should afford the front office plenty of flexibility in the offseason. Salisbury also writes that third baseman Maikel Franco is likely headed to meet with a specialist to have his ailing right wrist examined today. Franco was among the Phils’ hottest hitters for much of July and in early August, but his bat has faded as he’s played through considerable pain. With the 26-year-old Franco currently unavailable, trade acquisition Asdrubal Cabrera has been logging most of the time at third base. The Phillies did bring J.P. Crawford up as part of their slate of September call-ups and, paired with Kingery, that gives them several options to fill out the left side of the diamond. Pedro Florimon is also back with the big league club as an infield option on the left side. Long-time MLB slugger Ryan Howard announced in a post today at The Player’s Tribune that he is retiring from the game of baseball. Howard had not played during the 2018 season, but also had not formally hung up his spikes. Howard will finish out his big-league playing tenure having logged time in 13 seasons, all of them with the Phillies. Though he spent time with the Rockies and Braves organizations last year, Howard’s final MLB showing came in 2016 with Philadelphia. It’s perhaps too easy to forget now that Howard was once one of the game’s most productive power hitters. He was voted the National League’s Rookie of the Year in 2005 and its Most Valuable Player in 2006, emerging alongside players such as Chase Utley, Jimmy Rollins, Shane Victorino, and Cole Hamels to form a core that would soon take the game by storm. As it turned out, the fate of the Phillies was tied closely to that of its first baseman. Howard finished in the top-ten of MVP voting in every one of the five ensuing seasons, 2007 through 2011, helping to drive the club’s five-year run of NL East titles. Though the 2008 World Series win represents the crowning achievement of that era of Phillies baseball, the 2011 club actually turned in the most impressive regular-season performance with an excellent 102-60 record. That great team was bounced in stunning fashion from the postseason, though, with Howard making the final out of the NLDS on a play in which he tore his left Achilles tendon. As went Howard, so went the Phillies; neither was the same from that point forward. The once-feared slugger posted a .226/.292/.427 batting line over the next five seasons. The club played a cumulative 88 games under .500 in the same span. Of course, the relationship might have ended much sooner had it not been for the fact that Howard signed a five-year, $125MM extension at the start of the 2010 season — an agreement we examined at length after its conclusion. As I explained in that post, the cracks in Howard’s game may not have been obvious at the time of the deal, but began to show not long after. Mostly, of course, the contract represented a combination of partially but not completely related failures: then-GM Ruben Amaro Jr. and the Phillies’ brass did not accurately project Howard’s future and the big man’s body did not hold up. There was some tension later in his tenure with the team, though ultimately he played out his contract and bowed out after some nice moments to wrap things up in Philadelphia. While the club did not achieve value on that contract, it certainly made out quite well overall on a player who came to the organization as a fifth-round pick in the 2001 draft. And Howard expressed fond memories in his farewell statement, which is well worth a full read. MLBTR wishes him all the best in his future endeavors. The Phillies have activated right-hander Jerad Eickhoff from the 60-day disabled list and designated fellow righty Ben Lively for assignment, Todd Zolecki of MLB.com tweets. Eickhoff’s finally in line to pitch after going down in mid-March with a lat strain, an injury that was only supposed to shelve him for six to eight weeks. The 28-year-old ended up missing nearly six months, though, as he suffered multiple setbacks during his recovery and was even checked for thoracic outlet syndrome along the way. Fortunately, Eickhoff dodged that injury – often a catastrophic one for pitchers. He also pitched well in the minors during the rehab process, including at Triple-A Lehigh Valley, where he logged a 2.90 ERA with 6.7 K/9 and 3.8 BB/9 in 18 2/3 innings. Prior to what has essentially been a lost 2018 for Eickhoff, he held his own at times with the Phillies from 2015-17, combining for a 3.87 ERA/4.10 FIP with 7.99 K/9 and 2.58 BB/9 over 376 1/3 frames. Eickhoff started in all 65 appearances during that span, but he may work as a reliever upon his return. The Phillies’ rotation has been among the majors’ best, after all, as Aaron Nola, Jake Arrieta, Zach Eflin, Vince Velazquez and Nick Pivetta have each done respectable to exemplary work over 20-plus starts apiece. Lively, a Phillie since they acquired him from the Reds for outfielder Marlon Byrd in a 2014 trade, may be on his way to his third organization. The 26-year-old cracked the Phillies’ season-opening rotation and struggled across five starts before succumbing to a back injury, as he posted a 6.85 ERA/5.14 FIP and a 27.5 percent groundball rate over 23 2/3 innings. But Lively did log a solid strikeout rate (8.37 per nine), and he’s only a year removed from providing a passable 4.26 ERA/4.97 FIP in 15 starts and 88 2/3 innings with the Phillies. Plus, Lively has excelled at the Triple-A level this season, with a 2.42 ERA/3.21 FIP and 8.13 K/9 against 2.6 BB/9 in 52 frames. Blue Jays Claim Mark Leiter Jr. The Blue Jays and Phillies have both announced that Toronto claimed right-hander Mark Leiter Jr. off waivers from Philadelphia. Leiter Jr. had been designated for assignment earlier in the week. Leiter Jr. got his first taste of major-league action with the Phillies last season, tossing 90 2/3 innings in The Show. His initial performance was somewhat encouraging, as he posted a 3.88 ERA with a 7.89 K/9 figure through August. That showing was largely discredited by a 4.79 FIP, though, and come September the wheels fell off entirely. During a catastrophic final month of the year, Leiter Jr. allowed 22 earned runs in 25 2/3 innings, which included eight homers hit off the right-hander. This season has been, in some ways, even worse for the 27-year-old. While his 5.40 ERA across 12 relief appearances seems troublesome, the 7.11 FIP beneath the surface is downright dreadful. During those 16 2/3 innings, he’s also walked a whopping eight batters while allowing five home runs. All this has led to Leiter Jr. costing his team roughly half a win (per Fangraphs’ WAR formula) below that of a replacement level player. The Phillies have designated infielder Jesmuel Valdin for assignment, per a club announcement. The move was made in order to clear room for Pedro Florimon, who was activated from the 60-day disabled list. Valentin, originally drafted by the Dodgers, has been with the Phillies organization since 2014. He’s played both second and third base in the minor leagues, and earned his first taste of MLB action this season after batting .240/.346/.341 at Triple-A Lehigh Valley. That batting line came with a pair of homers and a trio of steals. His debut hasn’t gone well. Valentin has struck out at a 27.0% clip across 89 major-league plate appearances and mustered only a .177/.258/.304 line. Fangraphs doesn’t care much for him defensively, either, as evidenced by his -1.7 rating in that area of gameplay. With little value in the field and a 52 wRC+ during his first MLB showing, Valentin will enter the waiver wire and be available to be claimed by any rival club.